For this game we switched the sides around - there would be three fighting as the British Defenders (James, Alastair & Legatus) whilst Mark and I would command the Zulus. 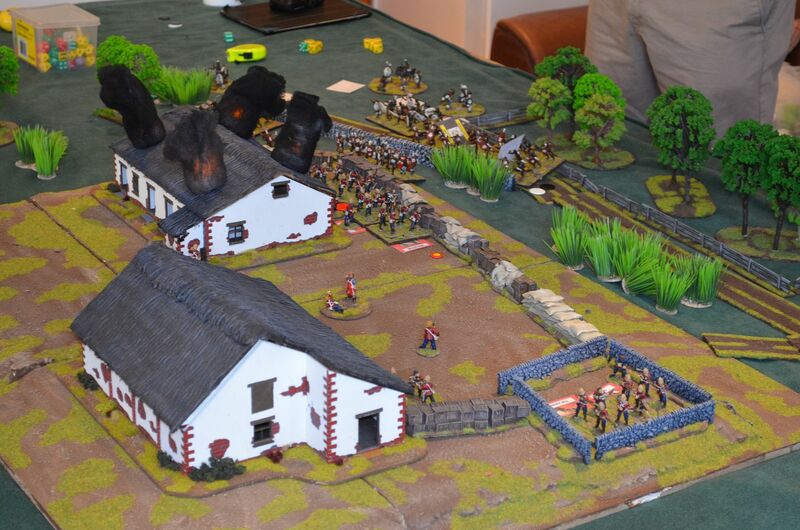 Again we used the Black Powder ruleset and inspiration was drawn from the Black Powder Zulu supplement. I was keen to make this a much more tactical game than the earlier battle with both the Zulus and British able to determine how the various assaults would play out. The battle at Rorkes Drift was fought from 4.30pm on the 22nd January until 04.00am the following day. The defence fought continuously for approximately 12 hours. During this time there were a number of assaults made by the Zulus. Our game will focus on this timetable. Having checked the internet I can see that sunset in this part of the world in January is around 7.45pm with dusk about 30 minutes later. Reports from the battle suggest that once night fell it was inky black and the only aid to vision came from the burning hospital. Had this building not have been fired I suspect that battle may not have even raged on into the night hours because surely the Zulus would have been as hampered by the lack of light as the British. I have also read that the Zulus did not particularly like to fight at night time. In other words one of the buildings in our game will go up in flames for the battle to continue past nightfall . So as part of the game we needed to consider the timings. The reports suggest that the Mission was under constant assault throughout the evening and it wasn’t until 4 am in the morning that the attacks finally petered out. This effectively is 12 hours of constant fighting. I think we can assume that the assaults would have been frenetic fast paced affairs but between assaults there would have been moments of uneasy calm. NB: All the accounts I have read so far seen to suggest that the vast majority of British Casualties (ie KIA) came from Zulu shooting NOT melee wounds – again this has to be considered in the game . I therefore decided to break the game into 12 phases. With each phase either a moment of calm or an assault. As the attacker the Zulu player will determine how these phases play. The game will start with phase 1 which will be the first assault. Thereafter the zulu player can initiate a second assault in phase 2 or use this time to ready his troops (rally, position for attack, etc) – He may only make a maximum of 6 assaults during the game or fewer if troops are no longer available. Two assault phases must be followed by one passive phase. An Assault Phase will be played out like turns in the rules – there is no limit to the number of turns in any given assault phase. Sadly the Black Powder ruleset does not feature rules for night time engagements so I have developed my own. And Minus 1 to hit at all ranges…. · Any building set fire will illuminate an area 12 inches from its edge. This will be denoted by a line of cotton. Shooting into an illuminated area carries no penalties. Ranges: Just a quick note on ranges - all firearms in this game have unlimited range however once the measure goes past 18" tonly a natural 6 hits. This reflects the cover and distances that sniper fire (on both sides) had in the battle. If the Drift is still defended by the end of turn 12 the British players has won. If during these 12 phases the British defence is routed the Zulu players have won. I have decided to use the Black Powder ruleset for this game and as mentioned I am going to use the scenario as laid out in the Zulu supplement as a base. Now having read through this several times I have come to the opinion that this book was rushed and somewhat incomplete. For example - no mention is given to the size of the Zulu units or how often they can attack. The book lists the Zulus as having four regiments (tick) each supporting three warbands (tick) so in total 12 warbands. 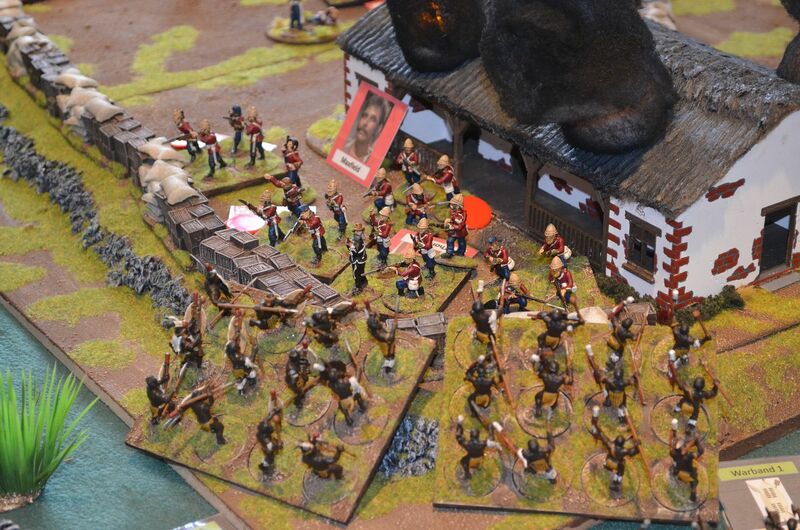 These brave natives are attacking 12 British units armed to the teeth in defensive positions – our last few games of Black Powder suggest the attacker must have at least a 3-1 advantage to have any chance of winning. I therefore am looking for the Zulus to have around 36 or more Warbands (although they will not all be able to attack simultaneously. So with this in mind the Zulus (clearly outnumbering the British in real life by 20/1) will be afforded many more units to attack with. However these units will not all be available straight away. Reports suggest that the attacks on Rorkes Drift were led by the INdluyengwe regiment with the other three following up behind, so our first assault will be led by this regiment in its entirety – thereafter the regiments can be mixed up. Each of the four regiments listed in the supplement book has between 900 and 1500 warriors. A total of 4900 warriors. Casualty reports from the battle suggest that the Zulus lost 1000 men killed and several hundreds wounded. Conservatively we could state that at least half the forces attacking Rorkes drift were either injured or killed in the battle. This plays well with the Black Powder rules that if half the force is shaken/routed the force can no longer attack (ie loses). As mentioned in my previous post I discovered that an Impi is just a generic term for an Army/Regiments. Regiments were actually called IButho’s and these were made up of several units called Amaviyo’s. Amaviyos ranged in size from fifty to two hundred men. The Amaviyo will become my standard warband and this scenario will represent 125 warriors. So using the Black Powder Zulu Supplement listed regiments we can determine that the Zulu force will comprise of 39 warbands. Each Zulu Regiment will be able to function normally until it has lost or cannot rally more than half of it’s warbands. It will be for the Zulu player to determine when best to try to rally these units and when to retire to maintain the integrity of a unit. For example the UDloko regiment will have 12 warbands and once 7 of these are either shaken or destroyed the regiment will cease to take part in the battle. The Zulus will have 39 Warbands with which they can assault the Drift. four regimental commanders and one overall commander. A regimental commander may only try to rally his own units. The supreme commander can affect any unit. For example let us presuppose that after the first assault the INdluyengwe retires with a bloody nose – the Regiment has 8 warbands. Of these 1 has been broken and three retire shaken. 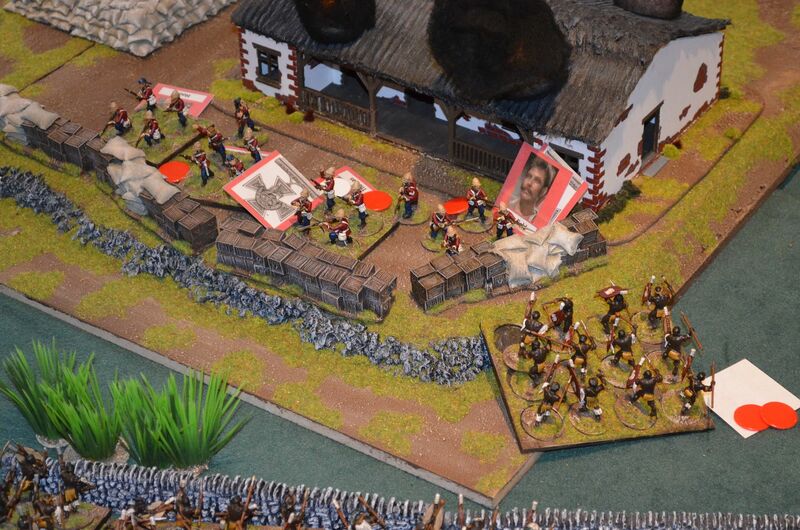 The Regiment is still operating (ie 4 units remain unaffected) – the regimental commander and supreme commander both successfully rally two of the shaken units in the passive phase. The Regiment now has six units that could be used in a subsequent assault. Its been often quoted by history writers that had the Zulus massed for one single assault on the defences they may well have overcome the defences but rather they attacked piecemeal. So in this game we need to make sure that the Zulus have sufficient forces for an assault but at the same time limit their numbers. In addition many of the contemporary reports suggest that the Zulus were adept at using groundcover to conceal their approach so therefore I’ll introduce the concept of jump off points for the Zulu attack. 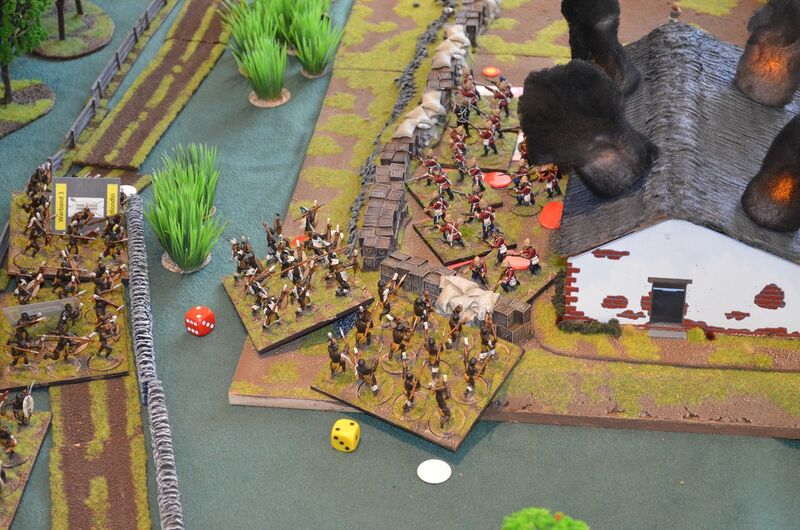 There are three Jump off points for the Zulus to approach from. These vary in distance from the British defences and afford different levels of cover. · A maximum of 10 units can attack from one jump off point. As has been mentioned above the initial assault will be led by the INdluyengwe regiment. They will start with 8 War bands lead by their own regimental commander (8+). The first assault will come from Jump point A or B and there will be 8 Feint Cards in the first deck. The Zulus have access to 8 Feint cards they may play during an assault phase. Units are placed on the table as if they are real troops but once fired at the zuulu player will turnover the respective card and show whether this is a real unit or not. Subsequent attacks by the Zulus will be dealt with as follows: The Zulu commanders will determine how many War bands are to attack – this can be a maximum of 12 units – These can be a mix of regiments with units from the same regiment starting from the same jump off points. The commander of each regiment attacking will always be on table starting at the jump off point where most of the regiments forces are played. To disguise how many units are actually attacking and where the assault come from the Zulu player will select the war bands from the deck of cards provided (each card denotes the regiment name and a war band number). Added to the deck will be a number of blank cards (feint cards) the total number of cards will be 16. These will be placed face down on the jump off points along with any officers. This way the British forces will have an idea of where the assault is coming from but not the strength of the attack. Imagine if you will that feint cards are part of the confusion and fog of war. Zulu Morale for each of the first two assaults is at +1 reflecting the eagerness of the warriors to get into action having missed the opportunity at Isandlwhana . These must both be made at daytime. The Zulu warbands during daytime will be steady (ie they get to reroll one failed morale check) – this benefit is lost one night falls. The Zulu Warbands are bloodthirsty – each warband once per game get this trait. Once the trait has been used remove one figure from movement tray to denote it is no longer bloodthirsty. All Zulu Units may make one move as if on initiative if not ordered. Zulu Commanders – All commanders are 8+ and offer no melee benefits. 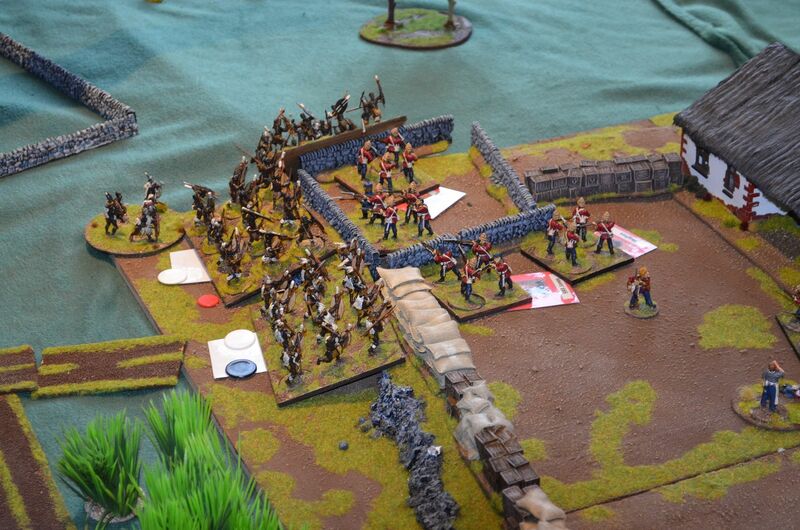 The Commander benefit allows Warbands that arte touching to attack/move simultaneously towards same target. When a Zulu commander announces he is going to retire the British may have one free shot for each unit that can see a Zulu unit retiring. Forces retiring are then placed back into the pool. During the actual battle a number of Zulus took up sniping positions around the Mission and fired into the encampment. The Zulu player at the start of each turn must allocate warbands to this task. Each regiment (ie 4 in total) can provide one unit for sniper duty. These are placed in the area where they will commence shooting. They will need 5+ to hit regardless of range (provided they are in range 18”). A natural 6 will disorder the British targets. 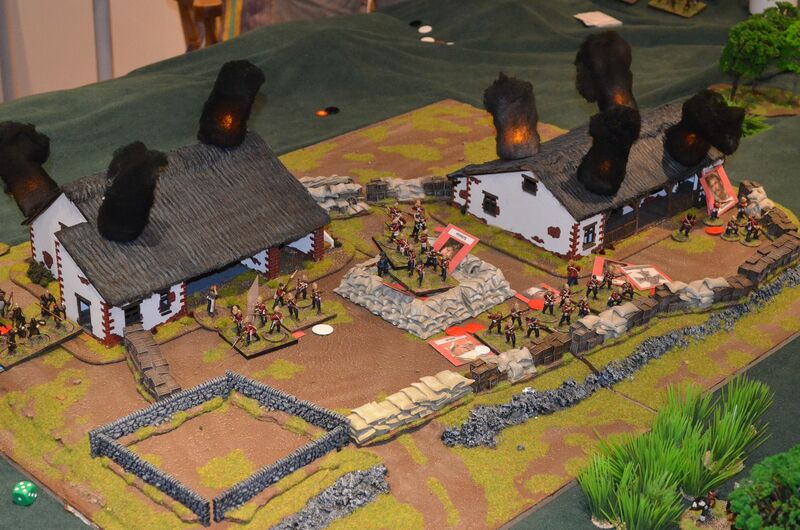 The Zulus may elect to try and set fire to the thatched roofs of the buildings. A warband must be touching the building. To set fire in that turn one dice is rolled 5+ a fire is started. The warband may continue to perform other actions. The history suggests that the drift was finally defended by about 140 men of all ranks and as per the Black Powder supplement the British will field a total of 12 units (each donated by a named character). Each unit effectively represent a squad of about 10 fighting men. These are based in fours. Chard, Bromhead and Dalton have 10+ command values and may add +1 to any units melee if they join the unit. Only Chard, Bromhead and Reynolds may rally units in the passive phases. The British troops are both stubborn and steady – they will be able to reroll one failed morale save in the game and ignore the first break. A British unit may deliver closing fire to any Zulu unit charging them. This is represented by a fire round for every move the Zulu unit moves towards them – eg if a Zulu unit charges a unit with three moves it receives three rounds of volley fire. 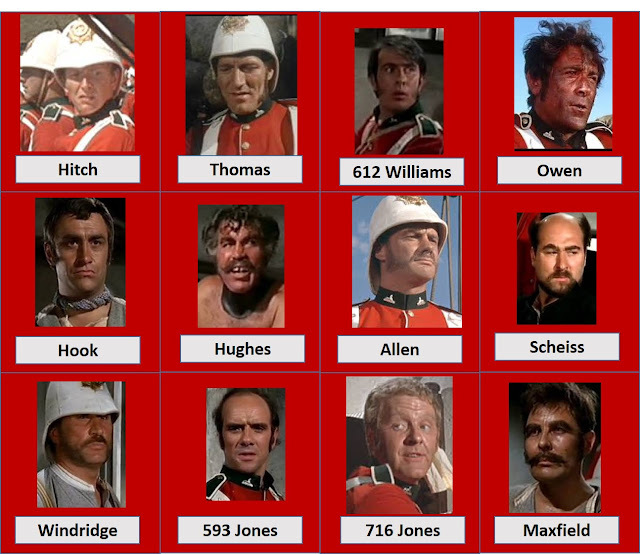 So how did our defence of Rorkes Drift play out? Following a light lunch of Pizza the British huddled over the defences to determine where they would stand. They had no knowledge of where the Zulus would attack or where they might come from. It was clearly very tense. As has been mentioned the first assault was conducted by the INdluyengwe regiment. Because they had 8 warbands the assault could also draw 4 feint cards. We elected that they would come on from the jump point on the Oskarberg terraces and advance on the hospital intent on getting this alight as soon as possible. One unit was placed on sniper duty. The Zulu sallied forth and were met with furious fire from the Hospital's southern wall and barricades joining the two buildings. 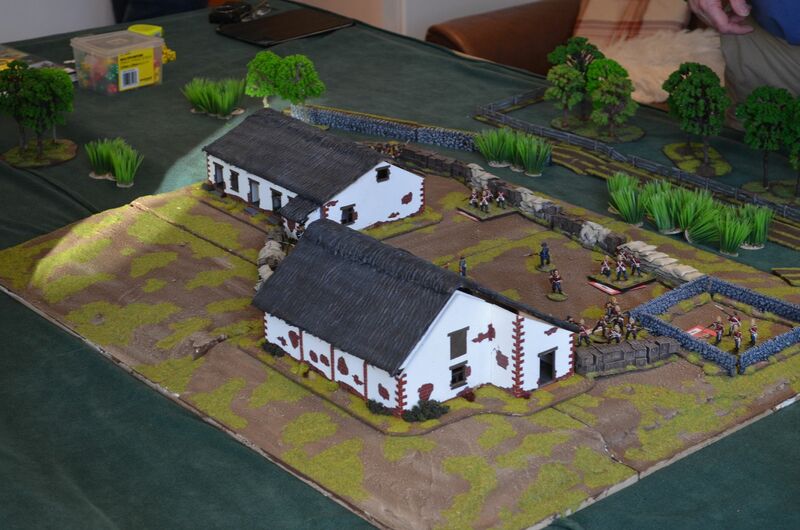 Fortunately for the Zulus the assault was screened by feint units and the majority of the regiment reached the hospital. One unit forced its way in and a vicious melee broke out inside the building. Maxfield the defending unit put up a brave show and held the advancing units. 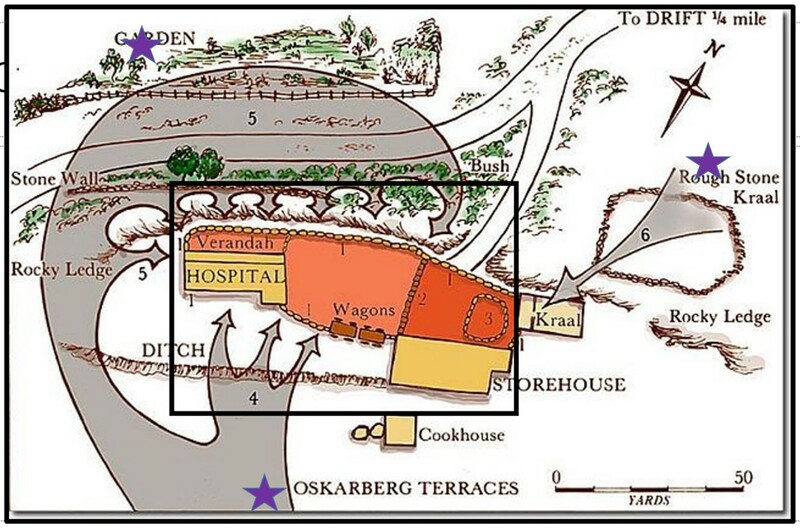 By now the Zulus had set fire to the building and were wrapping around the hospital and assaulting the western edge of the Drift. 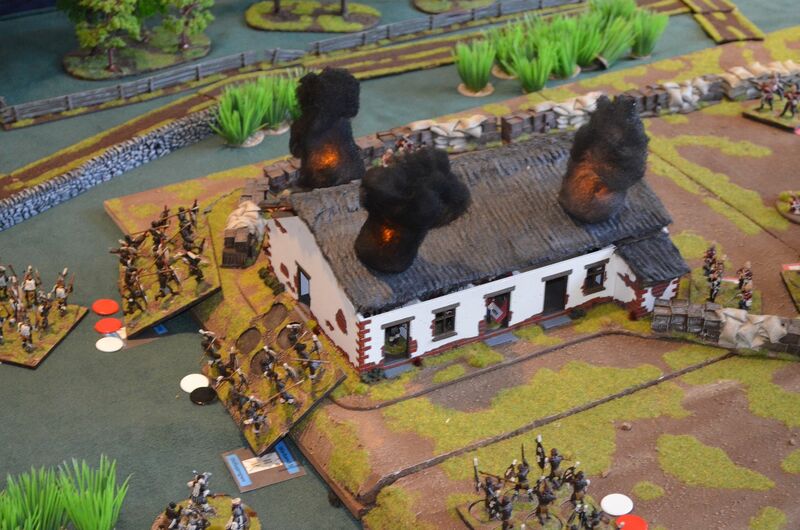 The Zulus were being driven back but some casualties were inflicted on the British. With the Zulu regiment in danger of breaking the first assault was called off and everybody inside the drift could take a deep breath. The ramparts had held but it had been nip and tuck. No sooner had the first assaulyt been repulsed the Zulus attacked again. This time 8 fresh regiments swarmed in from the Northern Garden attacking the North West ramparts whilst a further four units & four feints advanced from the Noth east through the stone Kraal. The Hospital was now fully ablaze driving the defending units out onto the perimeter walls. Bouyed on by the victory earlier in the day the bloodthirsty zulus (the +1 morale save was making a real difference)threw their bodies onto the ramparts. The British fire was murderous but they were getting pushed back from the barricades. With a cry of Usuthu the brave natives swarmed over the ramparts killing Corporal Allen and his squad and infuring several other units. The attack was pressed home but the numbers available to the attackers were dwindling. Chard and CSM Bourne lent their support to the gallant defenders. Maxfield having fought valiantly in the hospital was the first to awarded the VC for his heroics holding back two units of Zulus on the ramparts. Meanwhile the Zulu attack in the eastern section was also pressing home and fighting over the stone Kraal was brutal. 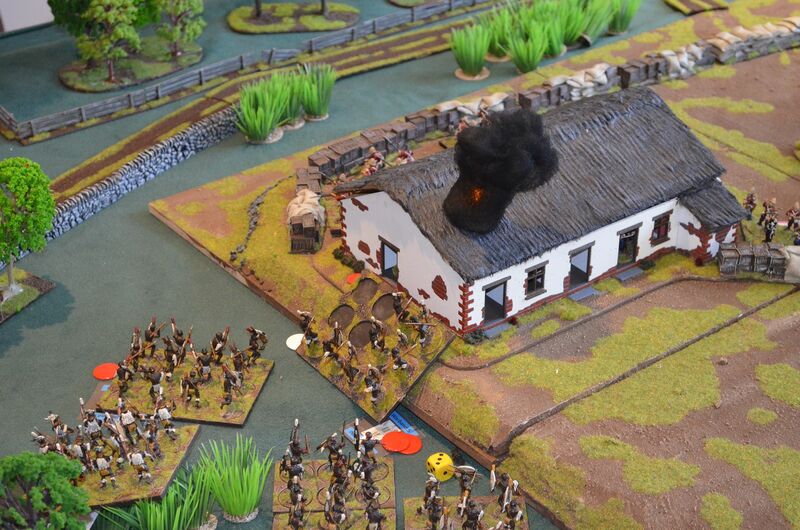 The Zulus pressed home and another brave British unit bit the dust . The combat on the North west ramparts was now petering out but in a final flurry of spears and bayonets Corporal Windridge and his squad were killed. 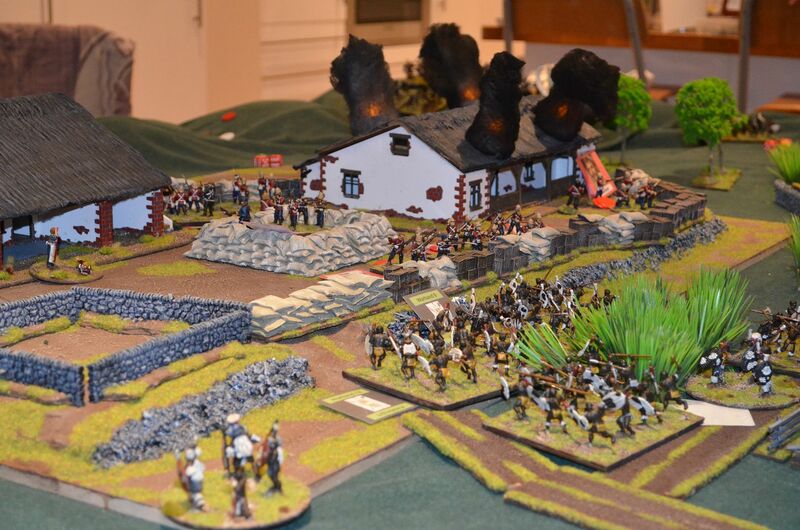 The British had lost 25% of their forces and there were still more Zulus circling the defences. It was time for a break in the engagement. As the Zulus tended their wounded and rallied their forces the British elected to build the redoubt in the middle of the Drift. Sniper fire continued unabated but was to a large extent completely ineffective. Once again forces attacked from the Garden and another large force pusjhed down off the Oskaberg -- intent on forcing a fight around the storehouse. 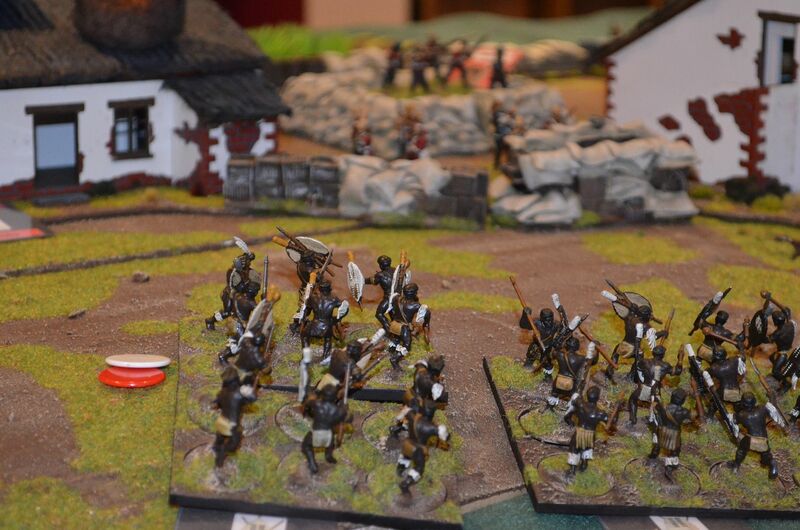 One Zulu regiment crashed against the northern ramparts only to be driven off and routed by volley fire. As the sun was setting the Zulu tried one final push with a fresh regiment against the ramparts on the North wall - four warbands charged and in quick succession three were routed as they hit the mealie bag walls and a wall of lead. The assault had failed. It was now 5pm real time and to be frank all the players were exhausted. 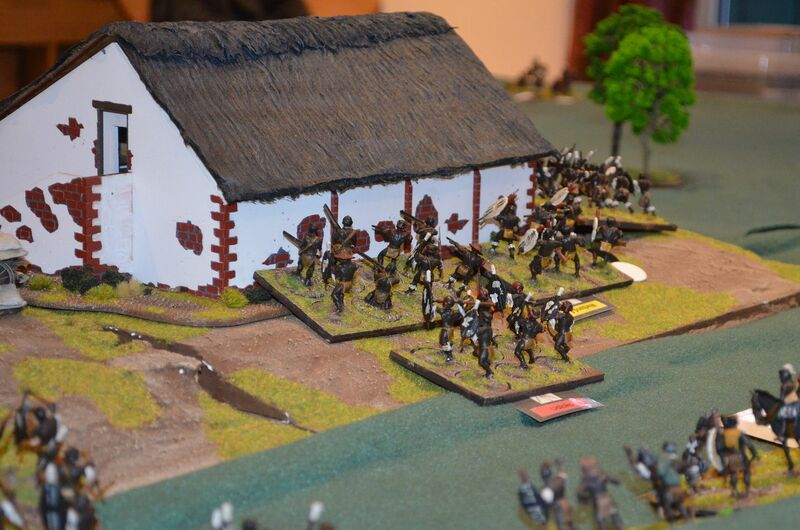 The Zulus had thrown the best part of half their units at the drift and only had a modicum of success. Sufficient forces still exist for further attacks but from a starting count of 39 warbands - 13 had been destroyed with two of the four regiment perilously close to breaking. It was agreed to capture the status of all the units on paper and potentially complete this gamer in the future however based on the superior firepower and defences of the British I think the conclusion might be staring us in the face. Wonderful AAR report capturing the essence of the struggle! I usually don't enjoy AARs but this was inspirational. Thank you. Yes, gripping report. Thanks for the write up! It was like watching the movie all over again, thanks for sharing. A great AAR! Quite a game. I played the defense of the Drift a couple of years ago to TSATF rules and really suffered from the Zulu's dropping fire from the hills. I think it was too effective compared with the historical event. It's one of those factors which make getting a good game balance tricky. Very cinematic report Eric, what a game to be part of I'm sure! What a great and well organised game. Looks wonderful , plus 1's to hit for anyone singing Men of harlech !!!! I am about to test play Rorke's Drift this weekend. Using the Zulu supplement. I see we have many of the same concerns with the scenario as written. Your take is brilliant and I plan to give it a try. Thanks! Warlord forum has been down. Played scenario Friday at ROCKCON. Had 7 players and it went great in time we had. Made corrections from playtest and our discussion. Everyone loved it. Look forward to playing myself to conclusion when we have more time. Not sure when Warlord forums will be back up, but here is my post on Rock-Con. you scenario played great.....wish we had a little more time. Look forward to playing again at home.